The last time I cooked a roast at home was 2013. I remember the occasion, my friends were over, it was a Sunday and I felt like going all out. Fast forward three hours and I was a red-faced slightly hysterical mad-woman who had gone through about six baking trays, twelve tea-towels and drunk half a bottle of the red that was meant for the gravy. My point is, cooking a roast is a tricky business and I’m fed up of worrying if the meat is cooked correctly and whether my potatoes are crisping to Nigella standards. My new motto? Leave it to the professionals. So that’s what I do, and luckily there are enough pubs and restaurants in Brighton who do such a cracking roast dinner that i’ll never have to venture near my oven on a Sunday ever again. One of these venues is The Independent Pub in Hanover – a stone’s throw from the lovely Queen’s Park. After scaling the hill from the Level, Tom and I (slightly out of breath) decided that we definitely deserved a good lunch. Turning up at noon seemed a good shout as we beat the rush and recevied a warm welcome from Matt (one of the owners) before being seated in a light and airy section of the pub. 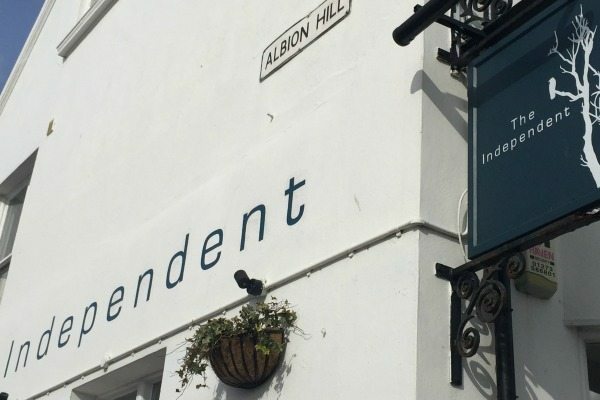 The Independent re-opened it’s doors in June 2015 (previously named The Walmer Castle) with the new Landlords, James and Matt proud owners of the freehold, meaning they are completely independent of any brewery or pub chain – hence the name! 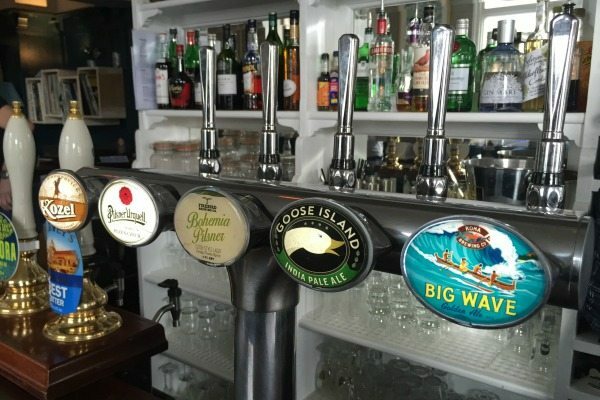 The beers, menu and music are carefully chosen by the staff, and the ales are rotated weekly so there’s plenty of choice for regulars! 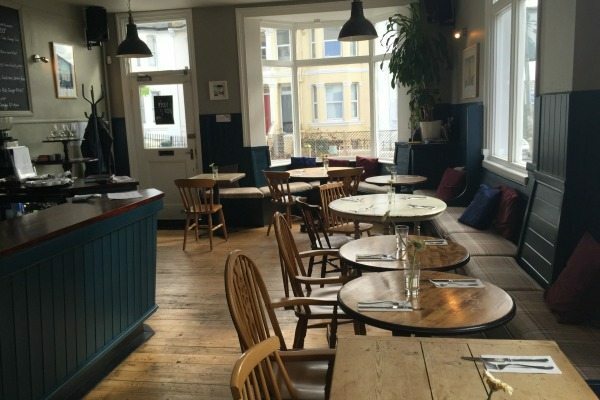 Talking of regulars, there’s certainly no shortage of them – by 12.20 the pub is full of families and Hanover locals who natter happily over their food and drinks, giving the pub a lovely atmosphere. 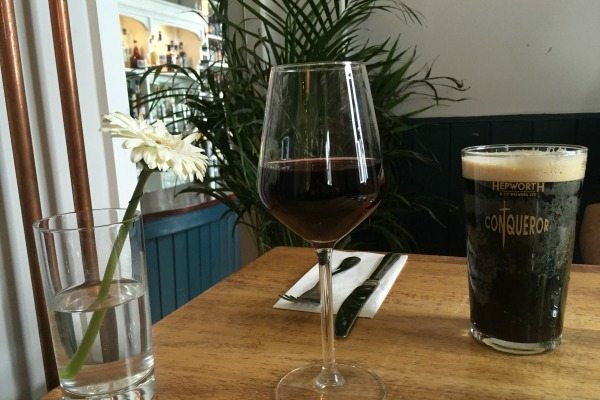 In terms of drinks I go for a Chilean Pinot Noir whilst Tom heads down to the bar to peruse the selection before choosing a pint of Hepworth ‘Conqueror’ stout which is brewed locally in Horsham. One thing I notice is that my wine is served in a proper red wine glass – a nice touch and something that is often overlooked in pubs. 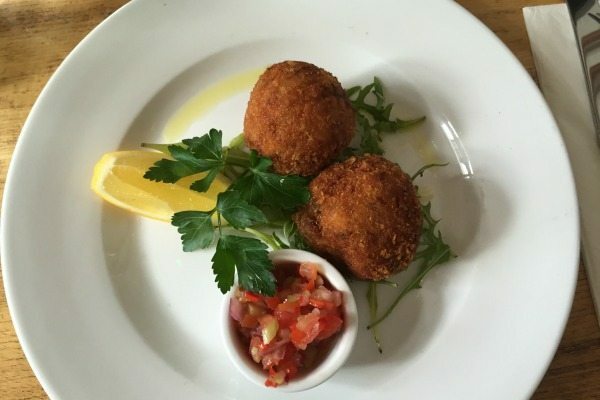 The Sunday menu is printed daily and consists of a small selection of light bites and starters before showcasing the roasts and main courses. There are two non-meat options, one being a vegan and gluten free tofu and sweet potato roast (with optional yorkie) and the other a tart of broccoli, spinach, onion and manchego (vegetarian). 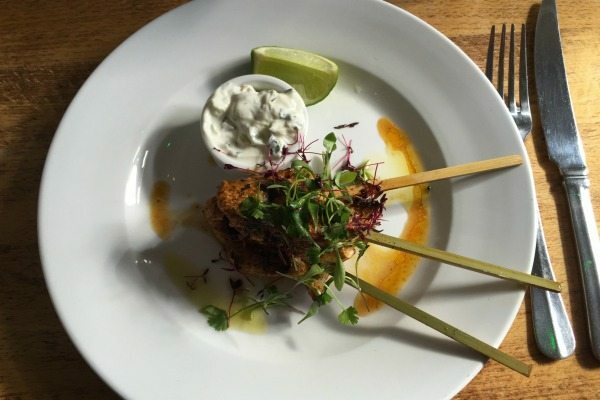 To start we ordered the arancini of wild mushroom and mozzarella served with a chilli and tomato salsa and the skewers of chermoula marinated chicken served with a cucumber and yoghurt dip. Coated in golden crumbs, each risotto ball holds a treasure of gooey mozzarella with delicious porcini flavour. The chermoula chicken is delicious – the marinade a flavoursome mix of herbs, oil, lemon juice, pickled lemons, garlic, cumin, and salt. The yoghurt dip is refreshing and takes me back to sunny days in Greece – a far cry from the February weather outside! 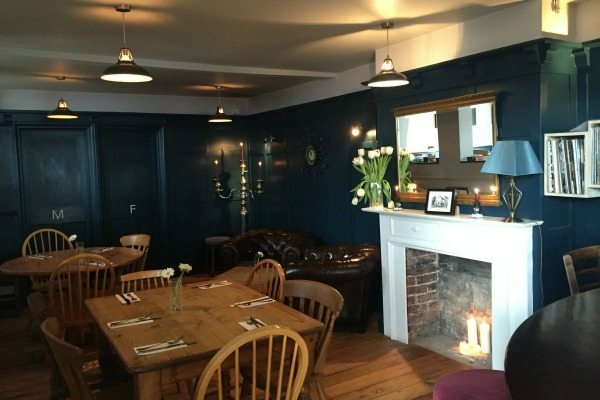 Whilst we wait for our roasts we take a quick look around, the decor has been completely re-done and retains a cosy pub feel but with a modern edge, created by using a lovely deep blue colour on the walls and plenty of lamps, candles and fairy lights. There’s a hint of the seaside created by white-washed accent walls and the sweeping bar is full to the brim with sparkling bottles. This is a pub who takes their house-keeping seriously! 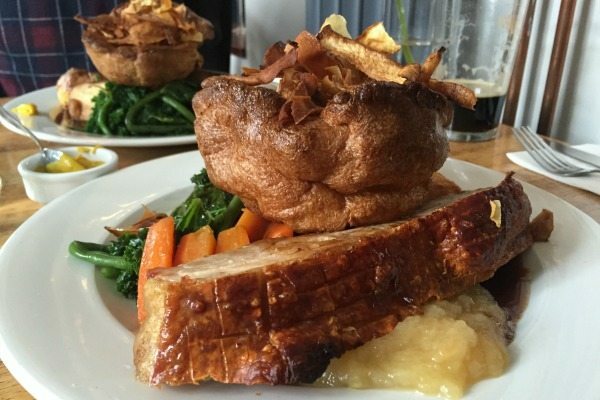 Our roasts come out steaming hot (bonus points) with a huge yorkshire pudding filled with parsnips crisps topping each plate. I went for the roast leg of lamb which was served as one large hunk of meat, delicious in flavour but I would have preferred a couple of slices as it was slightly difficult to cut through as one piece. Tom went for the pork belly which judging from the silence that ensued was as good as it looked. There was enough crackling to feed an army and the meat was cooked to perfection – melt in the mouth. Both roasts were served with roast potatoes and seasonal vegetables which included carrots and greens alongside a good splash of red wine gravy. 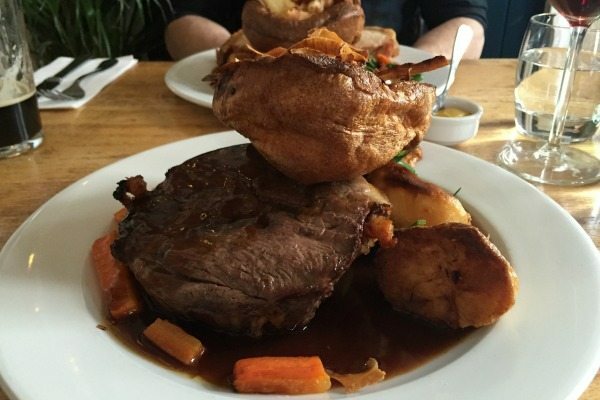 The yorkshire pudding is always one of my tests for a good roast dinner and this one didn’t disappoint – it was crispy on the top and slightly stodgy towards the bottom – move aside Aunt Bessie you’ve got nothing on the Independent! 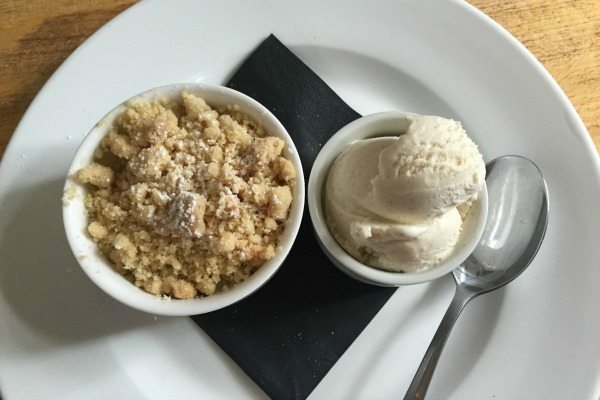 I wish all crumbles could be half fruit and half crumble! Is it worth the climb?